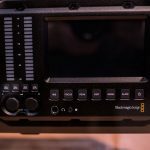 A couple of this year’s standouts came from Blackmagic Design, something that’s become sort of a common occurrence over the last few years. 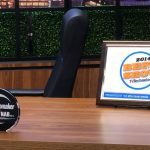 While we were expecting a new camera announcement by no means did we expect two. 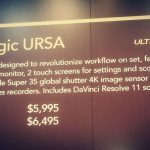 The first of these, the Blackmagic URSA (latin for bear for those interested), is our focus here and we try to go beyond just the specs and features to find out what you need to know about this exciting new camera like no one else can. 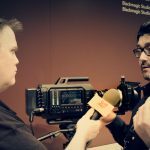 First off, Blackmagic’s Bob Caniglia introduced us to the URSA in all its capabilities, of which there are many. 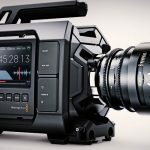 The URSA was designed to be a very all-in-one solution for shooting, and Blackmagic has piled on many features to this end. Perhaps most interesting is the URSA’s interchangeable lens mount, which allows you to swap out the the lens AND sensor of the camera. Blackmagic showed us an example of this, with the front lens/sensor removed and a Canon DSLR in its place attached to the rods in the front of the camera. 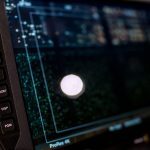 While it’s a very unusual feature, to essentially make the camera sensorless, it allows you to pick your sensor from any camera on the market and still use the other features of the URSA. 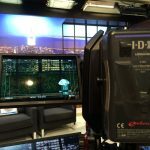 These other features include three (that’s right, three) built in screens, each with waveforms, focus peaking, and other monitoring assists found in many other monitors on the market today. Caniglia points out that these three screens are perfect for having multiple people on camera during a large shoot. So focus pullers, camera assistants etc. can all functionally use the camera at the same time. The URSA also has an internal liquid cooling system, as shooting in higher frame rates causes the camera to become hotter. As Caniglia mentions above, the URSA had been running for hours by the time of our interview, and the camera was cool to the touch. The idea for the URSA came directly from how shooters were using Blackmagic’s other handheld cameras. 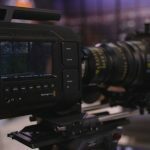 After seeing people build these intricate rigs to turn them into cinema cameras, Blackmagic decided to meet their customers directly in their demand with a fully realized production camera. 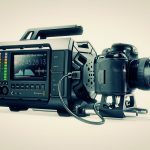 Caniglia further explains that the URSA is also meant to be a sort of base to build off of, especially as new cameras, sensors, etc. 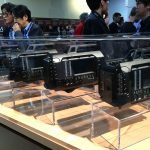 are released, allowing the buyer to “preserve their investment” and focus only on the parts they need instead of buying an entirely new camera. Finally, the URSA records to CFast cards, for which it has two ports. CFast, as Caniglia points out, was made for shooting video, and is perfect for higher frame rates. 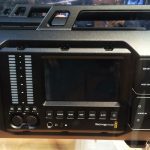 Blackmagic URSA is designed to be used on high end feature films, commercials, episodic television production, documentaries, electronic news gathering, music videos and more. 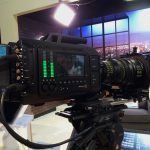 When used on jobs with a large crew, customers can easily dress the camera with high quality cinema lenses, rails, follow focus, matte boxes and more. 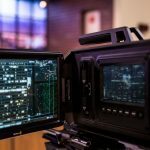 With built in scopes for exposure, focus and audio levels, built in dual recorders and the large 10 inch fold out on set monitor, customers can dramatically reduce on set equipment because it’s all built into the camera. 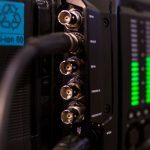 Features all standard connections, including dual XLR mic/line audio inputs with phantom power, 6G- SDI output for monitoring with camera status graphic overlay and separate XLR 4 pin power output for viewfinder power, 6G-SDI monitoring input, headphone jack, LANC remote control and standard 4 pin 12V DC power connection.